Servers | Tygem | A beautiful rivalry: "idontca1" vs. "ddcg"
A beautiful rivalry: "idontca1" vs. "ddcg"
The proverb says that nothing is ever done beautifully which is done in rivalship: or nobly, which is done in pride. 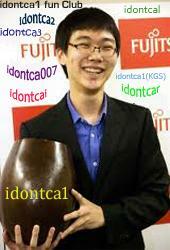 Those who regularly follow what is going on Tygem have noticed, of course, the rivalry between "idontca1" and "ddcg". The repeated duels between these two wonderful players are the best opportunity for the viewers of seeing fascinating games at the highest level. The first clash between the two, at least under these handles, was dated January 18 this year, 1-0 for "idontca1". Just for the record and maybe to satisfy our curiosity, let's keep the track of the games that followed and see the score statistics. 1 - 2 (5.06.2011) It seems that this second defeat angered "idontca1" so much, that he took a cruel revenge in the next 8 games. 10 - 4, 10 - 5, 10 - 6 (2.08.2011) "ddcg" glorious day with 3 wins to nothing. As I mentioned so many times, "idontca1" has always a great sense of humor and his games have "that indefinable something" that makes them so damn attractive! For example, in today's game, please, try to guess the moves 163, 165, 169 and 175, before you press the forward button. 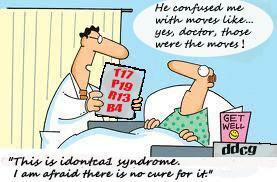 It is my firm belief that nobody in this world can predict these moves. If 163, 165 and 167 paved the way for 169, the total unexpected move at 175 seems to be made just for pure fun.